In case of a no show or a cancellation later than 2 week prior the reservation we will charge the whole amount of the stay. Check in time is from 3 PM till 8 PM (early and later arrivals must be announced in advance by email). If you do not arrive 3 hours after the specified arrival time your booking will be cancelled. We can offer free parking at our Restaurant (400m away). Parking must be reserved by email. Tourist tax NOT included - 3,13 €. 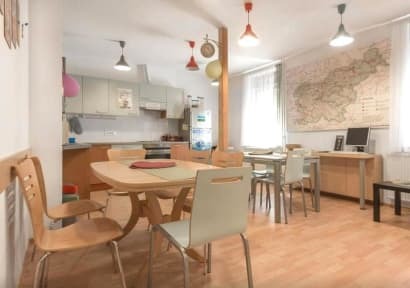 Very nice hostel close to all attractions in Ljubljana and 20 min walk from the train/bus station. Alex (the manager) is awesome, she can tell you all you need to know about the city and Slovenia (pubs, food, tours, places to go) and is overall very helpful and friendly. Security is OK - front and dorm doors have locks and you get a large locker in the dorm. Cleanliness was impeccable. The towels are small, big ones can be rented though. Truly awesome place, totally recommended! What a charming place! It made me feel like a I was at home! It is a small place where you can easily talk with everybody and make friends quickly. The lady was really caring and helpful to me showing me places to see, eat and hangout. Aleks was really helpful and she had nice tips for what to see and do in the city. The hostel is very clean, in a nice area short walk away from the city centre. Really chill place to stay, Aleks is extremely helpful and friendly. Would definitely recommend!! The owner is very professional & helpful, our stay was very disciplined and relaxed. Good deal. 100% recommended. Staff is pretty awesome and gave me nice tips about the city. Good location, except for the church right across the street. The bells kept going every hour throughout the night, bring some earplugs. Aleks was very helpful with recommendations on what to do, I'm glad I listened to her advice. Hostel didn't have much of a social vibe but if you're looking for a place to chill for a few nights, it'll be great for you.